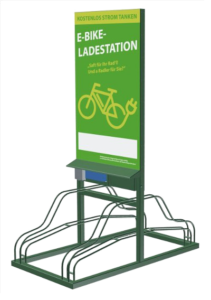 Charge4Bike The charging system is the perfect supplement to off-road bicycle-paths, to guest-houses, communities or is simply a great attribute to innovative customer service – the point of sale at the local “corner shop”. The charging process is simple and safe. With Charge4Bike we are offering an extremely cost effective charging system for E-Bikes. 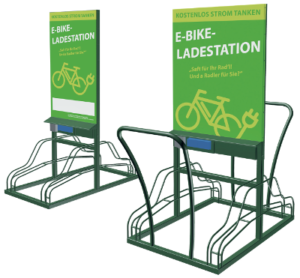 As well as providing a service, the Charge4Bike system is an all-in-one charging station, advertising space and visual point of interest combined, an ideal mechanism for gaining customer loyalty. Locations with Charge4Bike gain in attractiveness and are visited more regularly by customers or guests. The operating company – e.g. the landlord or retailer must grant access to the charging sockets. Further innovative product variants are currently under development, e.g. with integrated lockers. Charge4Bike – Park up and charge up! Charge4Bike is an extremely low priced system specifically designed for the charging of E-Bikes. A weather-resistant multiple socket outlet with appropriate security monitoring enables the charging of up to 4 E-bikes. Please note that, in each case, approval for the socket outlets for this system must be granted from the provider. Charge4Bike Plus – Parking spaces in accordance with certification standards as set out by the ADFC. With our variant Charge4Bike Plus we are offering a parking space area which is compliant with certification standards as set out by the ADFC (Allgemeiner Deutscher Fahrrad-Club e. V.). 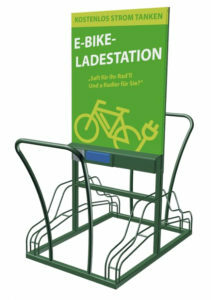 The system includes an additional, user-friendly rail, against which bikes of all standard sizes and others of extended breadth may be leant in safety. • Additional, convenient support rail. All Charge4Bike variants are engineered and manufactured in accordance with certification standards set out by the ADFC (Allgemeiner Deutscher Fahrrad-Club e. V.).